On Valentine’s Day here on PST we all wrote a post together, about the first perfume we ever loved. Mine was Le Feu d’Issey, a sadly discontinued masterpiece by Issey Miyake, that I wore from 1998, when it was launched, until I couldn’t find it anymore and moved on to other things. 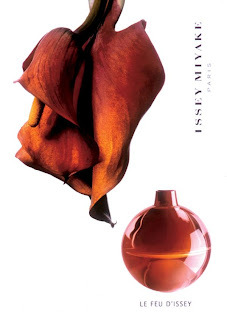 That was before my perfume infatuation began, but nonetheless Le Feu d’Issey always had a place in my heart and well as my olfactory memory. It is a unique scent, unlike anything I have smelled since and that is saying something. Since perfume turned into a way of life for me, I was always on the lookout for Le Feu. I regularly searched online, had my eyes open at flea markets and in perfume stores that seemed like they had stock from the fifties still on their shelves. But no Le Feu. It remained elusive or when it popped up now and then, it was not affordable. I was not willing to pay over 200$ to a questionable seller on eBay. Last week my luck changed. I was in a perfume store sniffing my way through some old classics, when I saw a glimpse of the familiar red behind a yellow-striped army of Giorgio Beverly Hills boxes. I started to hyperventilate – could that be what I thought it was? I started to burrow my way through the Giorgios and unearthed the top – Issey Miyake it said. Yessss!!! I would have paid 200$ or more that minute. With not much help of the supremely bored SA I managed to extricate Le Feu from its Beverly Hills prison where it had languished for the last ten years probably. A perfect, sealed 75ml specimen was mine for a retail price from ten years ago. Sometimes when it is good, it is really good! Many say Le Feu was ahead of its time and I agree. It failed massively on the market and was discontinued not long after its launch. A different perfume called Le Feu d’Issey Light was released in its stead, but that is a mere shadow, or a very distant relative to the original and not worth much discussion in my opinion. Of course this one is still available. Le Feu was created in 1998 by Jacques Cavallier and there are several notes lists out there. Basenotes lists Bulgarian Rose, Coriander, Sichuan Pepper, Golden Japanese Lily, Gauaic wood and milky Amber. Osmoz lists Bergamot, Coconut, Rosewood, Anise, Jasmine, Rose, Milk, Caramel, Cedar, Sandal, Vanilla and Musk. What ever is really in there – Le Feu smells simply intriguing. If you ever smelled Le Feu you know what I mean and you won’t have forgotten what it smells like. I write a perfume review a day, but I am at a loss for words when it comes to describing Le Feu. If pressed (which I undoubtedly am, since I chose to write about it!) I would say I smell a spicy, rosy, bready mix with hints of woody and lactonic notes, drying down to a musky vanilla-rose base. But I am far from satisfied with that description. Maybe I am also a little reticent to deconstruct it. I feel the same with a perfect poem, awe and respect, happy to enjoy it in its entirety but unwilling to poke at it and make it yield its secrets. In this case, I am not the type who needs to know how a magician does his tricks, but I am delighting in the sense of wonder watching that trick fills me with. Le Feu is strange and wonderful. Odd and beautiful. Weird and delectable. Maybe its brilliance is in the creation of a scent that is not resembling anything in nature, being something utterly new and original, unique and inimitable. Le Feu makes me jubilant, I delight in its sweet and sour jolt to my nose. Every time I smell it, I am glad I found it again and sad that such a marvel is not for everyone to have. Please bring back Le Feu d’Issey! Call it Le Terre d’Issey or L’Air d’Issey by all means. I think the world is ready for a new run with this extraordinary perfume. I agree. Le Feau d'Issey was way ahead of its time. It was an unusual CdG-like fragrance that might have been far more appreciated as a limited distribution niche release than on a mainstream department store shelf. Congrats on scoring a brand new bottle! It's getting near impossible to find anymore. Oh my gosh! I used to wear and love Le Feu d'Issey all the time, and was so excited when I saw the title of your blog. To be honest, I had all but forgotten about it. Like you, when my bottle ran out and I couldn't find it anymore, I moved on to other scents. But I remember it distinctly, and now I long to wear it again. I always likened the scent to Christian Dior Fahrenheit for men, which is also wonderful on the right man, but pales in comparison to Le Feu. Thank you for taking me on this trip down memory lane! I have always wanted to try this and have searched for YEARS, to no avail. I don't think I'll ever get to smell it...so sad. Only the good (perfumes) die young! I remember both versions and back then I chose the Light version. But I liked the original one as well. How wonderful to find your first perfume love again after searching for so long! And at a great price too. It's the kind of thing we dream about :) Many congrats, it sounds truly unique. Oh, I never tried this. As we are very much behind with department store perfumes, I'll see if I can find a bottle here to try. I loved Le Feu d'Issey. There is nothing like it. But I found something similar in the middle notes of Comme des Garcons 3. It made me think of Le Feu. I am so thrilled for you B! Finding something that you want and love, and finding it for an absolute steal is truly one of life's great pleasures. Enjoy the he'll out of that bottle! I first smelled FdI around 1999, long before I became the sniffing beast that I am now. I could never imagine myself owning a bottle of it but I liked it so much that I bought it for a friend. She didn't like it. Ever since I 'm on the lookout for a reasonably priced bottle, no such luck yet. I have found some comfort in Etro's Etra. It has that spicy, milky flower vibe. But I am planning to ask my friend to give me back the bottle she never uses. Is that too much? absolutely, as a niche release I am sure Le Feu would have been a huge success. I hope you get the chance to smell it. It is such a distinctive perfume, despite years of not owning it I - like you - could remember exactly how it smelled. so right, it is always the good ones that die young! the two versions are very different, Light was the safer bet, it appeals to more people, but lost the unique touch of Le Feu. Maybe you are lucky, those old, not much frequented shops are as good as gold sometimes. that is interesting to hear. I must try CdG 3 with your words in mind. Thanks! If she never uses it anyway, she may be even glad to be able to make you happy! I'd like to think you are right, maybe it was like that. Olfactoria, that is quite a score! Now I am curious too, of course! It sounds just amazing, and so very different from most of the others in this line, not minimalist at all. What a fun post, B, congrats on your find! Will probably never smell this one, but I'm happy knowing the bottle made its way to someone who will appreciate it. That bottle was hiding there waiting for you! I'm so happy you've been reunited with what sounds like a dream of a scent. Wouldn't it be great if fragrance houses would TELL the world that they are discontinuing something. These days they could Tweet it. 'Your favourite fragrance [insert its name] which has been an embarrasing commercial flop and lost us lots of $$ is finally being put death. More fool you for buying it, you have hopeless taste. But hey! We have a light version that's way more modern/fruitier/cleaner/more ozonic/etc!' Oh wait, that's too many characters isn't it? To me, it's a smoky-milky-rose with spicy bite. Theorema is similar to me, but Le Feu is warmer, silkier, and sexier. Now I'm lusting after it, and that bottle is rad! Thanks for the review. I had 2 bottles, and it's one of my favourite perfumes.. I have been searching for it ever since but no luck. it was an unusual smell yes, but i loved it.